Hello lovies. Lately, I've been seeing these DIY Cushion Cases that range from USD $5 to USD $10 or so and I kind of wondered to myself "If I already have a cushion case, shouldn't I be able to clean out the one/s I have already and do the same?". 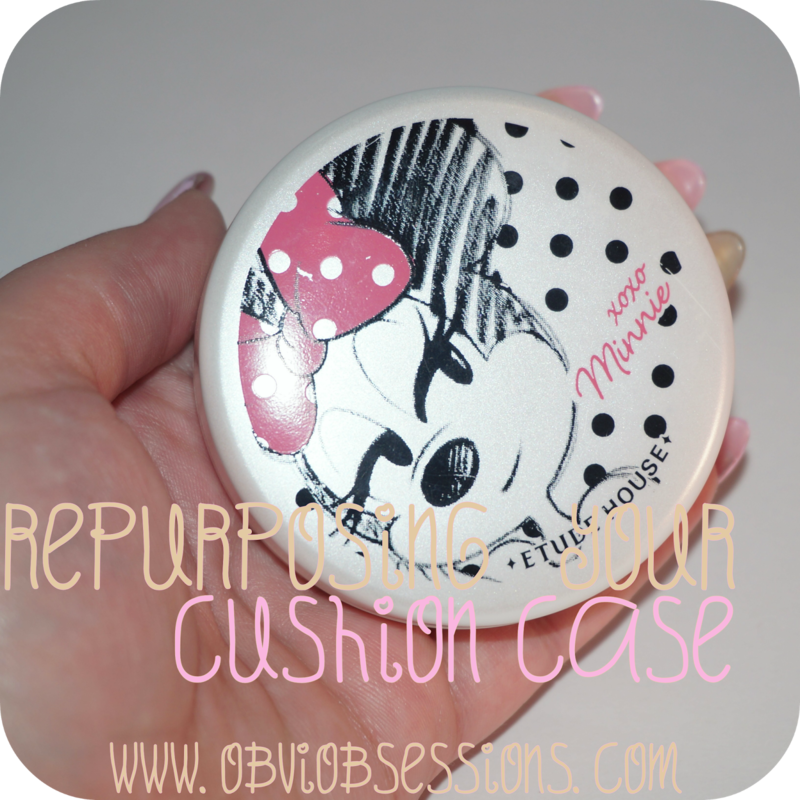 So, here we are, with my little tutorial on how to effectively clean out a pre-existing cushion case and refill it with your preference of BB, CC, or DD cream. You know I'm not one to openly complain about things over social media. I'm not the type of blogger that gives much insight into my life unless I really feel the need to. Basic information like how Little Ham is doing or how my week has been, if I'm sick or not. I don't like to delve into my personal life very often, and with the few blogger people I do, I speak with them in confidence. They know who they are. When it comes to sponsors, if you're loyal with me, I am loyal with you. Recently, I was approached by a company to review products for them. If you're a friend on my personal Facebook, you'll instantly know what I'm referencing. Of course, I promptly agreed to have them send me products for review as I've been dreaming of the day I would be approached by them for this type of opportunity. Emails were sent back and forth. I was notified that I would be getting a shipping email in my box within the week and sure enough, there was one. Inside, it detailed what I would be getting, and this is where it goes downhill. I kindly notify the company that I had already bought the item in question. Again, emails were sent back and forth and I was told to go ahead and keep the item and that I would be sent a different item. I'm thinking how wonderful it is to have such great and quick service. I was hopeful within the next week that I would see another email letting me know about the shipment of a different item. Weeks past, about 2 1/2 to 3 weeks if I'm correct and I didn't get an email. So of course I sent another email to the customer service rep I was emailing and I got no response from this person. I may have emailed back two times until I got an email from another rep who told me I would be put back on the list and to look out for an email. A week passes and no email... until I was sent a mass email explaining something within the company would be ending. I thought nothing of it and went about my time, still hopeful for an email about products being sent my way. That is until I came to the realization that what was ending was something I needed to be concerned about. I emailed once again. By this time, I'm not thrilled to be bothersome. This gist of the conversation went as such. I was told that since I had reviewed the item and was sent the same item of no charge, that there was nothing they could send me. They had run out of blogger items... I was then asked to be okay with what I got and I emailed them back that it was fine because what am I supposed to do at this point? Going through the companies hashtag on Instagram, I notice the company has been sending out free products to bloggers in the past few weeks and it almost feels like a slap to the face. I'm not impressed nor am I happy. You would think, as a company who has had blogger help to raise your company, you would ask before sending items. I've been buying from this company for about a year now. I've done countless reviews, worked hard to produce honest and clear reviews with good photos. I've over done on some and have changed my blogging style to fit better. I'm almost certain that I don't want anything more to do with this company. I've been a loyal customer. I've been nice and I've been understanding, but when you promise to send someone something, actually do it. I've had this same issue with another company ( coughcough Honest Skin, but that's long gone ), about saying they will send something and not pulling through as promised. If this makes me salty, this makes me salty and I can take that. Comment down below if you feel I may be overreacting or maybe if you've had a similar issue with other companies. For now, I'll be thinking about the wonderful new vanity and drawer set I'll be getting to put all my makeup and skincare products in. I need motivation to blog. Thanks for listening. Love you, my ever lovely lovies. Here's part one to our Epic October Collaboration Month! We teamed up with YouTube fashion and beauty mentor Vagabond Youth to curate an epic autumn makeover box, with its sole mission in helping you master your fall beauty routine! Whether you're a makeup whiz, or just need a few beauty pointers, look no further than our collaboration with this chic Los Angeles chick for best-selling makeup K-Beauty faves, as well as dazzling tutorials for beautiful, everyday looks! Look out for Memebox X Vagabond Youth to master the art of K-Beauty!
" This is a Memebox must-have for all you My Cute Wish-list fans out there! You'll become weak to the knees at the sight of our box full of precious packaging, fun and cheeky names, and all things that are as cute as a button. If you haven't already passed out from cuteness overload in our previous My Cute Wish-list boxes, be prepared for a dizzy spell from the explosive levels of adorable in this third box! In all seriousness though, snag the latest addition to the My Cute Wish-list series because it surely will not disappoint! " Hope you all had a safe and fun Halloween! I tried to take Little Ham out but we didn't know which place would be good to go to, so we did something special for him. At the end of this review, I'll show off a few of my favorite shots of him in his Halloween costume! I recently picked this product back up after holding off on using it for some reason. I've been using another cleansing oil that I need to review, but decided to give this one another try and WOAH, I'm so upset that I didn't start using this more than I was. Wanna know why? Keep on reading!